New York- Casio and Nicki Minaj have teamed to launch their newest camera. Tryx. 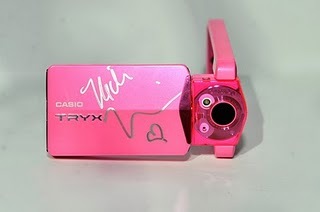 Nicki Minaj will also be auctioning off a special edition Pink Tryx Camera autographed by herself for Japan relief efforts. Check out this video of Nicki at the press conference and on her pink double-decker bus in the middle of Times Square. Check back for updates as we will be posting pictures and video from the Casio Tryx Out NYC 2011 Launch Party with performances by Nicki Minaj and the Roots.